Barely one week after President Muhammadu Buhari blamed the rise in attacks by suspected herdsmen on foreign militia once trained by Libya’s Muammar Gaddafi, the United States military Monday expressed great concern over incessant attacks by foreign extremists in Nigeria and other West African countries. Speaking at the African Land Forces Summit in Abuja, the Commanding General of the U.S. Army, Africa, Brig.-Gen. Eugene LeBoeuf, said insecurity and terrorism in Nigeria and other West African nations have been fuelled by the invasion of foreign extremists in the region. LeBoeuf’s remarks came just as gunmen, masquerading as herders of cattle continued their rampage in the Middle Belt, killing four policemen in Benue State and many residents of Tiv extraction in neighbouring Nasarawa State in the last three days. Suspected herdsmen disguised in military fatigues also met their waterloo Monday in Yogbo community in Guma Local Government Area of Benue State when Nigerian troops prevented them from carrying out a reprisal against residents in the area. On the increasing attacks, LeBoeuf said the U.S. military had set in motion a strategic plan to assist Nigeria and other nations within the region with reliable border security plans. He said: “To respect our security cooperation activities, we again will support border security activities through invitation to help support our African allies. 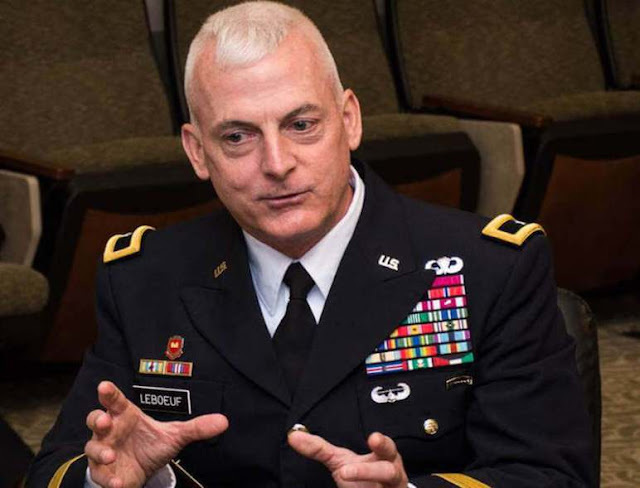 LeBoeuf explained that the U.S. would continue to support Nigeria in strengthening its defence policy, which will be geared towards combating terrorism and extremism in the West African sub-region. The Chief of Defence Staff (CDS), Gen Gabriel Olonisakin, observed that the need to combat terrorism, arms proliferation and extremism had become imperative given the wave of attacks in recent times. Olonisakin said: “Violent extremism terrorism, human trafficking, proliferation of small arms and light weapons as well as piracy have continued to pose security challenges to our individual and collective countries. “The army chiefs of various countries including our partners need to develop and adopt a unified approach to confronting these challenges. Tackling security challenges such as those highlighted above requires a comprehensive decision and unified approach by all stakeholders. “There is a need for sincere and active collaboration between all stakeholders to strangulate the sources of funding, weapons and groups that pose or have the potential to pose a security challenge at national, regional or continental levels. Also speaking, the Chief of Army Staff (COAS), Lt.-Gen. Tukur Buratai, stated that the African Land Forces Summit was the single largest gathering of African senior military leaders and other army chiefs from across the globe on the continent. He said the forum will afford the African countries the avenue to share experiences on global terrorism and to forge a common approach to combating transnational threats and crimes such as violent extremist organisations, terrorism, arms proliferation and piracy. Buratai noted that “terrorism, proliferation of small arms, piracy and human trafficking remain major security challenges facing the African continent with rippling effects across the globe”. “Activities of violent extremist organisations such as Boko Haram, Al-Shabab, Ansarudeen and Al Qaeda in the Magreb have continued to keep our security forces busy but we are committed to ensure the safety of lives and property. “In this regard, I am delighted to inform you that Nigeria has recorded significant progress in taming the excesses of the Boko Haram terrorists group. “I hope to give you some insights on our operational commitments as well as an update on the current situation during plenary. It is my view that combating the menace of Boko Haram and other violent extremist organisations would require collaborative efforts,” he stated. The summit was attended by the heads of armies of several African nations including Nigeria’s Chief of Naval Staff (CNS), Vice Admiral Ibok Ekwe-Ete Ibas, among other dignitaries. The summit on improving security on the continent coincided with reports that gunmen, suspected to be herders of cattle continued their rampage in the Middle Belt, killing four policemen and other residents in Benue State as well as many persons of Tiv extraction in neighbouring Nasarawa State over a 72-hour period. In Benue, four police officers and seven other residents were killed in Ayinbe in Logo Local Government Area of the state when the so-called herdsmen ambushed their patrol unit enforcing peace in the area. This was confirmed by the chairman of the area council, Mr. Richard Nyajo, in a phone chat. He said several riot policemen were killed in his domain and many others sustained serious injuries while some were missing. He said the herdsmen ambushed the policemen in the Tombo council ward with many of them managing to flee. “It has not been confirmed the number of policemen killed but many other persons are reported dead. This is what those who managed to escape told me,” Nyajo said. The Benue State Police Command also confirmed the incident, saying its personnel came under attack by “insurgents” at Anyibe, Tombo council ward of Logo LGA between 6 p.m. and 7 p.m. on Sunday and early Monday. A statement issued by the command’s spokesperson Moses Yamu said at the “moment the police have suffered four casualties”. According to Yamu, additional reinforcement (including the air assets of the police) deployed by the Inspector General of Police (IG) was in pursuit of the murderous gang. “They shall definitely be apprehended with their weapons of destruction and made to face the full wrath of the law,” the statement said. Also, suspected herdsmen Monday attacked Yogbo community in Guma Local Government Area of Benue State during a reprisal against residents of the community. A few weeks ago, a group of herdsmen were killed while in transit at Yelwata, a neighbouring town to Yogbo. According to a local source, the gunmen invaded the area around 4 p.m. but met their waterloo as four members of the militia who were dressed in military uniforms were gunned down by troops of the 707 Special Forces Brigade deployed from Makurdi, the Benue State capital. The source said the gunmen were many in number and were disguised as military personnel. “We were lucky that the troops of the 707 Special Forces responded quickly after the people started calling for help. They repelled them with superior firepower gunning down four in the process. “Others escaped but from the what we saw of the remains of those killed, they were certainly not Nigerians, we suspect they were mercenaries,” he said. The Special Adviser to the state governor on Security Matters, Lt. Col. Paul Hemba (rtd), confirmed the incident in Yogbo and commended men of the 707 Special Forces for saving the people of the community from another bloodbath. “Fulani herdsmen attacked Yogbo village this afternoon burning down several houses. Troops responded killing these four while others fled,” he said. Also, the Assistant Director of Information, 707 Special Forces Brigade, Major Olabisi Olalekan Ayeni, confirmed the attack to reporters. He debunked initial speculations that those killed were military men assisting the herdsmen. He said no military identity card was found on the deceased, contrary to claims by some locals that they could have been soldiers disguised as herdsmen. During the incident, however, it was not clear if there were casualties among the residents. In neighbouring Nasarawa, gunmen also suspected to be Fulani herdsmen, went on the rampage in the state killing scores of Tiv villagers at different locations across the southern senatorial district at the weekend. The attackers were reported to have carried out the dastardly attacks simultaneously in Awe, Keana, Obi and Doma Local Government Areas, leaving many dead and at least 19 persons with severe gunshot and machete wounds. At the time of filling in this report, thousands of fleeing Tiv villagers were reported trapped along the Agwatashi-Jangwa road axis in Obi LGA shortly after the marauding herdsmen sacked over 200 villages including Uvirkaa, the home town of a serving commissioner in Governor Tanko Al-Makura’s cabinet, Gabriel Akaaka. THISDAY further observed that thousands of fleeing villagers were also stranded in the streets of Lafia, the state capital, apart from those who took refuge in different internally displaced persons camps at Agwatashi, Aloshi, Awe, Adudu, Obi, Keana, Doma and Agyaragu, among other locations. A visit to the Dalhatu Araf Specialist Hospital, Lafia, where eight of the victims were receiving treatment as a result of injuries sustained from the attacks, also revealed that five dead bodies had been deposited in the hospital mortuary, of which three were later released by the police for burial. Confirming the coordinated attacks to reporters in Lafia, President of the Tiv Youths Organisation in Nasarawa, Peter Ahemba, said the entire Tiv villages in the southern part of the state had been sacked, adding that most of the affected villages had been occupied by the invaders. He said: “As I speak to you, seven corpses of our people killed this morning by the suspected Fulani marauders in Wurji village in Keana LGA have just been recovered and brought to Keana town by the police. “Also, last night, five of our people were killed in the coordinated attacks with seven others still missing at Kertyo and Apurugh villages in Obi LGA. “Three days ago, we recorded eight deaths from similar attacks in Kadarko area, four from Aloshi axis and one person from Agberagba, all in Keana LGA. “Another six persons were shot at Imon village and were rushed to Obi general hospital as a result of which one of them later died. This is just a few of the deaths we recorded within the last three days as a result of these senseless attacks,” he said. The Tiv youth leader who alleged that the gun-wielding herdsmen were conveyed in trucks and brought into the state to carry out their inhuman acts, added that it was now clear that the incessant attacks on the Tiv people were no longer protests against the anti-grazing law in Benue State, but a calculated attempt to exterminate the Tiv community of the state. He restated his appeal to the Nasarawa State Government to urgently stop the carnage and called on the international community to intervene in order to save the state and country from the current bloodbath. When contacted on the phone for comment, the Police Public Relations Officer of the Nasarawa Police Command, Idirisu Kennedy, confirmed the attacks on Imon village and other Tiv settlements, but said he was yet to be officially briefed on the scale of the casualties.